Most people gain some familiarity with nursery rhymes as children, reciting “Humpty Dumpty” in school or picking out favorites from a big collection. This introduction usually comes through a Mother Goose story book, but that fictional old lady (or goose in a bonnet, depending on what book you have) isn’t with whom these rhymes originated. While a lot of rhymes can be traced back to a certain time and place, many came to be the same way as folklore and fairy tales—passed down over the centuries with no precise origin or even meaning. Because of that, not only has some of the wording of the rhymes changed over time, but any version can be treated with varying interpretations and imagery. 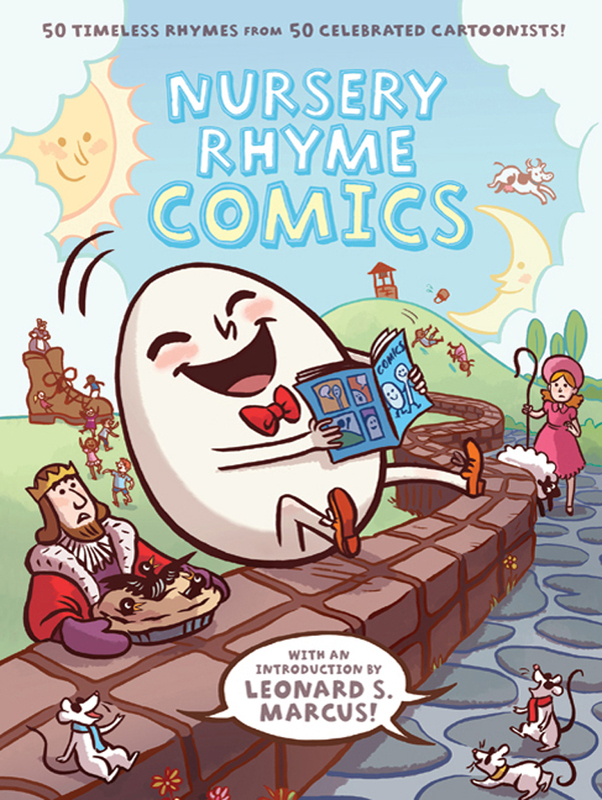 Despite their age, these sing-songy, fun, sometimes weird rhymes continue to resonate with children, so it makes perfect sense for publisher First Second to reinterpret the stories through one of the more popular mediums today—comic books—in their collection Nursery Rhyme Comics. Altogether there are 50 rhymes presented in this book, each one drawn by a different artist. In my experience, such a wide variety of creators almost inevitably leads to just as much variety in quality. Somehow, this is not the case. Instead, First Second has gathered 50 amazingly talented artists who, despite their differences in design and technique, make each page a treat. Thanks to the brevity of the rhymes, the comics take up no more than three pages each, so very little time is spent with any single artist. These sudden shifts do create a little bit of abruptness as you move from short rhyme to short rhyme. 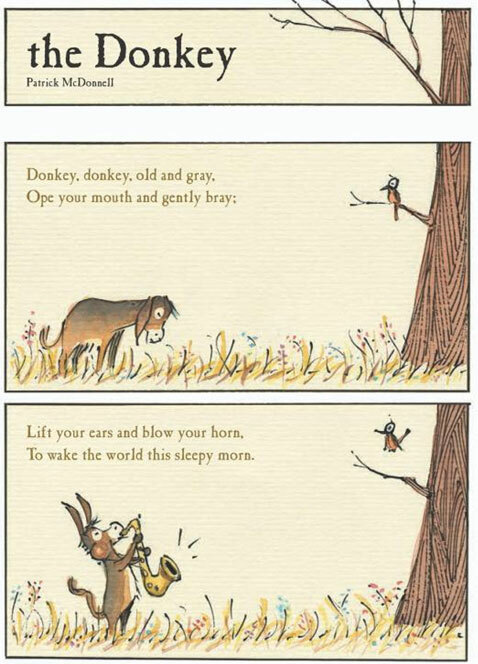 Fortunately, editor Chris Duffy managed to arrange the comics in a sort of arc, beginning with “The Donkey” playing a saxophone “to wake the world this sleepy morn,” moving into more active comics, and then slowing down towards the conclusion of “Wee Willie Winkie” as the story’s children fall asleep with their own copy of Nursery Rhyme Comics. With so many great artists on board, it would have been a shame to have them all adhere to a certain theme or mood, and it seems that First Second wisely allowed their artists to interpret the rhymes in any way they wanted. Style and mood range from things like the calm watercolors of Patrick McDonnell’s “The Donkey” to Reina Telgemeier’s bright cartoons. But the artists also give us their own takes on the rhymes themselves. Telgemeier’s “Georgie Porgie,” for instance, is a kid at his birthday party getting pie all over the girls he kisses. And in Andrew Arnold’s version of “Hot Cross Buns,” a pigeon steals cakes from a pair of bratty kids. 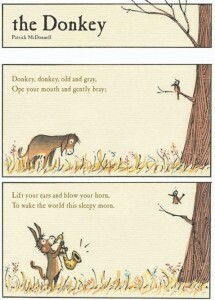 Artists interpreting some of the more nonsensical rhymes, like the weird non sequitor at the end of “I Had a Little Nut Tree,” have fun with stories that just don’t make much sense anymore. Then there’s “Hush Little Baby”—a song with pretty general action—transformed by its artist into an active conversation between a father and his daughter, making excellent use of word bubbles and creative panels. One thing Nursery Rhyme Comics proves by the end is how effectively nursery rhymes can converted into comics. These sing-songy stories have no narration that the artist must carve out, and no descriptive prose that they must decide whether to write or visualize. Instead, these are stories so simple that the artists may come at them with all their creative talent. This collection serves as a pretty great introduction to nursery rhymes for kids, covering all the bases, from weird and funny to calm and peaceful rhymes. This book can also be used as a sly way to introduce comics into the life of a kid you know—offering up so many styles and tones that any kid is sure to find a graphic novel niche to enjoy. Dialogue and narration are spaced out nicely, preventing the pages from becoming overly cluttered with words, which makes this an easy book to read out loud with a child, but also fun for an older kid (or an adult) to read by him/herself. Thanks to the artists First Second gathered together, this was a thoroughly enjoyable book. And whether or not you’re already acquainted with the rhymes included, it’s so much fun to see how the artists chose to adapt them.